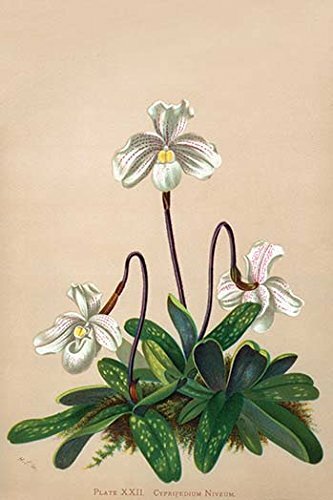 Buyenlarge 0-587-26918-9-P1218 Thai Lady Slipper Orchid; Cypripedioidea (Edition 8685)" Paper Poster, 12" x 18"
Orchid; lady's slipper orchids, Lady slipper orchids or slipper orchids are the orchids in the subfamily Cypripedioidea, which includes the genera Cypripedium, Mexipedium, Paphiopedilum, Phragmipedium and Selenipedium. They are characterized by the slipper-shaped pouches (modified labellums) of the flowers - the pouch traps insects so they are forced to climb up past the staminode, behind which they collect or deposit pollinia, thus fertilizing the flower. Wall26 - Canvas Prints Wall Art - Sunset Thai Countryside Thailand | Modern Wall Decor/ Home Decoration Stretched Gallery Canvas Wrap Giclee Print. Ready to Hang - 16" x 24"